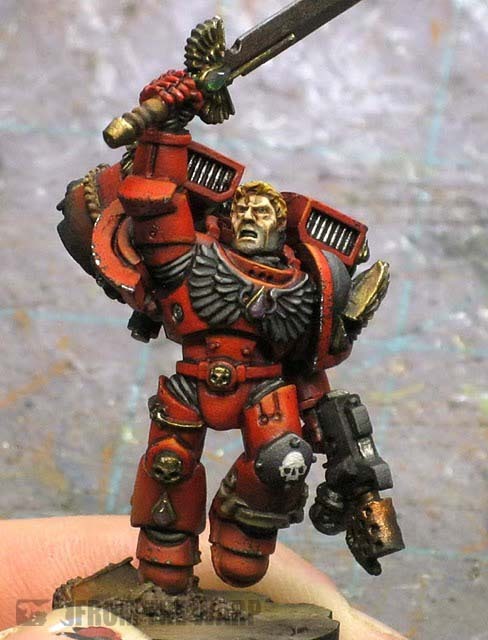 This time around, I've got the pleasure of painting up a Blood Angels Terminator Banner Bearer. Since I don't usually play or paint Blood Angels or know their background, I've got my work cut out for me. I've needed to do a good bit of reference work to make sure I'm not doing injustice to the Chapter and background. Similar to what I did for the Storm Wardens project, it amounts to finding what I can about them that's relevant, looking for pictures for color scheme ideas and talking with those who are in the know to make sure I'm on the right track. After a few emails with Chris (the Blood Angels project leader), I figured out what colors I'd be using to paint the figure itself. 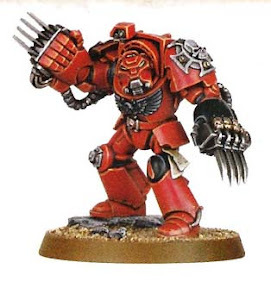 I dug up this image here from the Blood Angels Codex as reference to what should be red vs what should be painted black and such. Who knew their left hands were black? I was pointed in the direction of Brother Scipio from the Space Hulk game as another example of how to paint my model. While the left gauntlet would be black, the fingers would be red. That and his storm bolter casing needed to be red as well. These kinds of little things matter both for unity of the squad and consistency across the board. When it came down to the nuts and bolts of how I would be painting this guy now that I had my scheme, I knew I was going to use the same process I used when I painted a Blood Angel Vanguard Veteran for The Battle for the Cure charity Auction. The process is fairly simple and with a little patience, can yield some nice results. To see how I painted this guy, the basic process is outlined here. I'll be covering it more in depth when I post pics of the Terminator when I get to actually painting him. While it's not a difficult process, it can be a little time consuming with all the washes the model takes. I don't use any black wash on the armour... the dark areas are built up using a series of blue and green washes to keep the color a bit more vibrant. Back to the Codex I went looking to see what I could find out about their heraldry. On the page with some banner examples, I found this little tidbit of text. 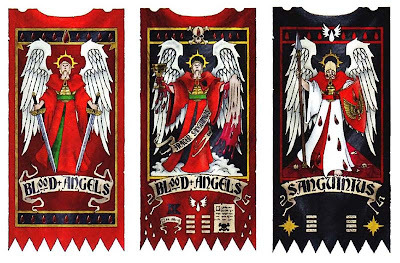 Like most Space Marine Chapters, the Blood Angels have many different Chapter Banners, each commemorating a mighty victory or particularly pivotal campaign. 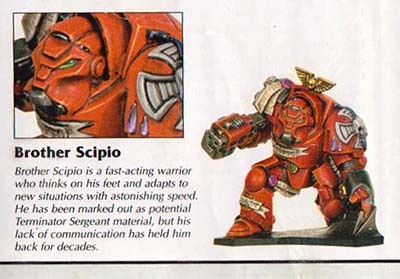 Each Chapter Banner carries a stylised image of Sanguinius, with the exact detail of his weaponry and accoutrements a reference to the event the banner celebrates. They go on to show a few examples of banners where the weaponry is changed depending on what battle the banner depicts. 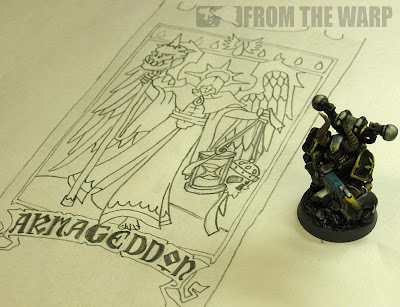 So now I have my layout for my Armageddon Chapter banner. It will have a similar image to one of the few below along with a set of weapons relative to the battle itself. Ghazghkull returns to the arid world at the head of another, vaster Waaagh! Over two dozen Space Marine Chapters respond this time, which is fortunate as the Blood Angels are forced to deploy much of their strength against the growing threat of Hive Fleet Leviathan. Nonetheless, honour demands that the Chapter provides assistance to beleaguered Armageddon and Dante sends his 3rd Company and a generous complement of support units. In the course of the campaign. Captain Tycho finally succumbs to the Black Rage and dies a valiant death on the outer walls of Hive Tempestora. Command of the 3rd Company passes to Galan Machiavi. Now that I had my battle "description" and the layout of banner, all that was left was to blend the two elements into a new banner for the specific battle and this project. I sat down and started sketching out some ideas and came up with what I thought would work out fairly well for the final banner design. You can see from the picture below that I work much larger than the actual size of the finished banner. Sort of like a "three-up." By working larger like this, the artwork becomes much more detailed when it is scaled down to the correct size for the figure. I incorporated a few things I think fit nicely with the idea of the 3rd war for Armageddon and I decided on the color scheme from the banner on the far right of the three seen in the Codex. I like the black looking one most of all and it's not a scheme I see often. This is the same process I use when making regular 40k banners on cardstock. My next Heroes of Armageddon post will cover the prep work for the Terminator. Since he's holding a banner pole and being added to a resin base, I had to do a little bit of work to him. 1. Contribute to the project and Doctors Without Borders. 2. Help get the word out by displaying the project logo on your blog. For those already flying the project logo in support, thank you! And remember, you could win this guy and the army he's part of by contributing to the project. Looking good, very good sir! That looks awesome- can't wait to see it painted up! Thanks guys, as I get more done, I'll be posting it.